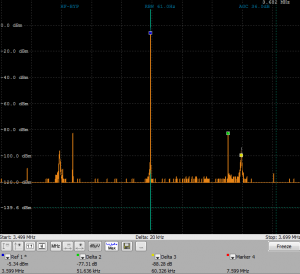 After bringing up the transmitter section of my N2ADR frontend i measured some IMD and spectral purity data. Quisk has a nice feature to create very clean measurement tones internally. This makes measurements very easy. The amplifier after the TX DAC is a BGA6589 supplied with 80mA out of a 7.5V source. 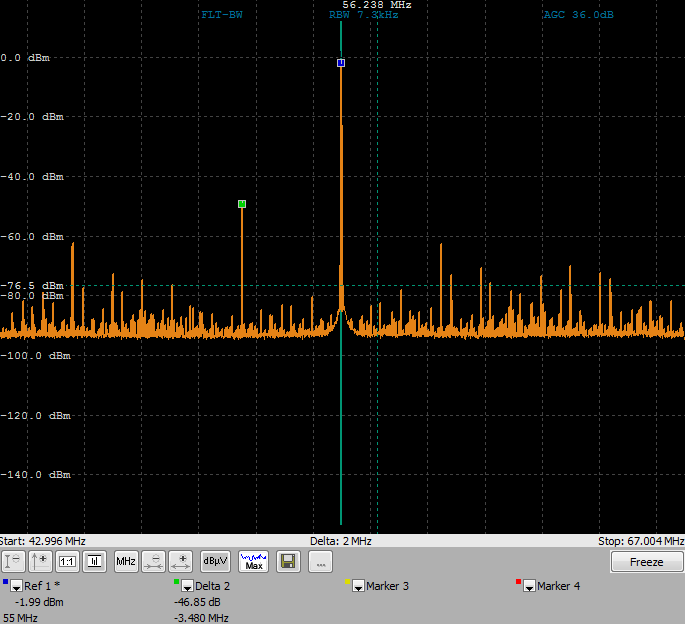 When not driving the DAC with full power i see really good IMD figures. 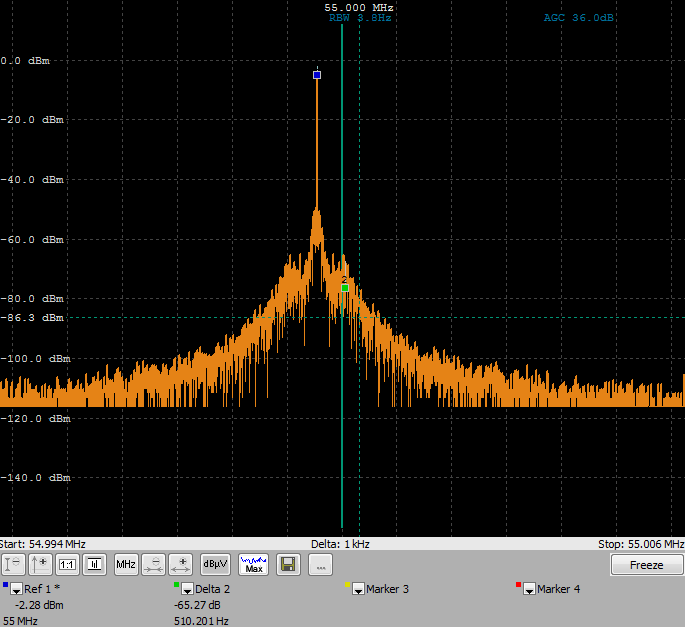 IMD3 around -45dB below the wanted signal. 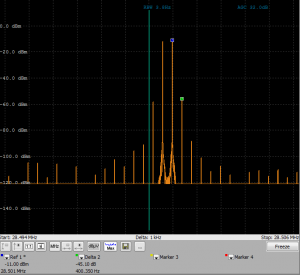 When looking to lower frequencies (lets say below 10MHz) and transmission of a sine carrier the spectral purity looks rather good. 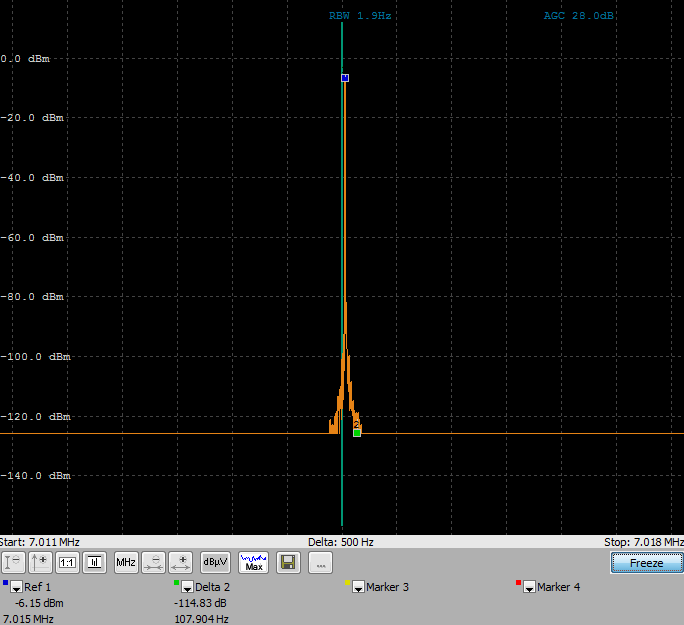 The next figure shows a 40M signal which gets around -110dB noise 100Hz off the transmission frequency. At the upper edge of the frequency range of the frontend the situation becomes significantly worse. 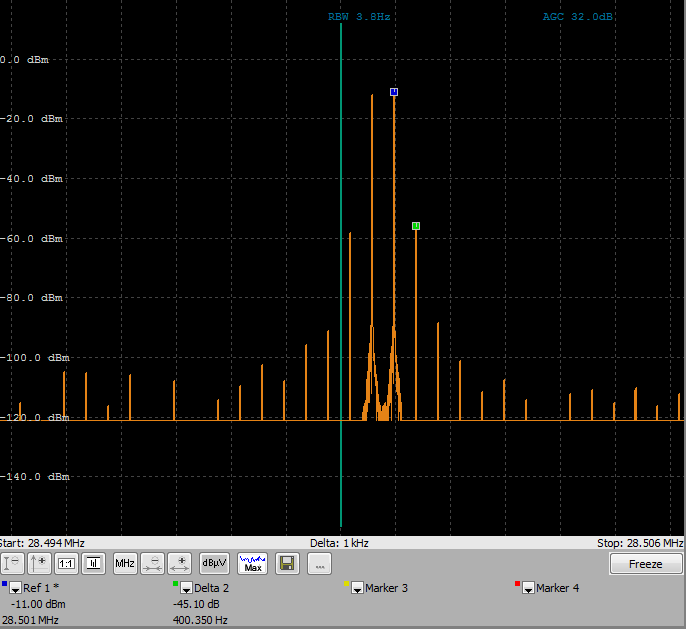 The internal digital oscillator seems to create many spurs over a wide frequency range. 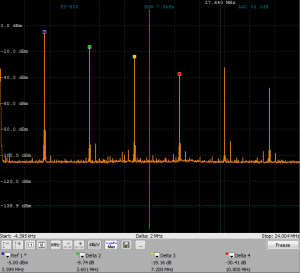 For low output frequencies the wideband spectrum looks rather promising except for the overtones. 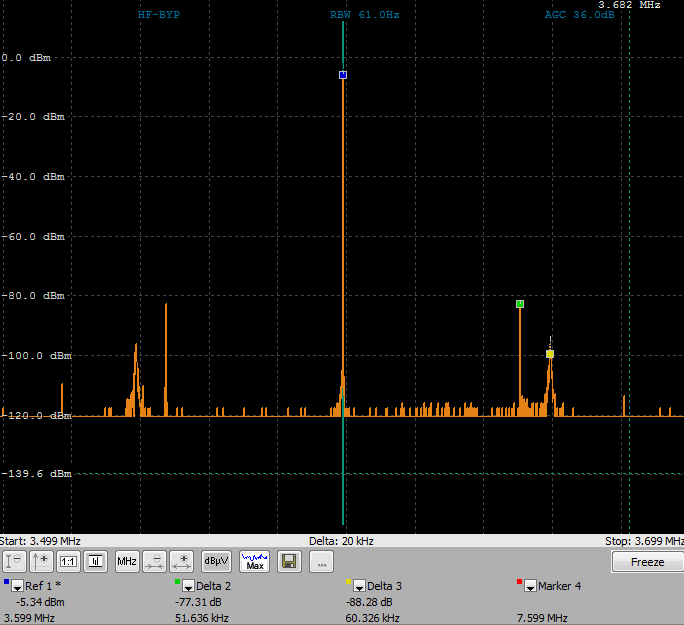 But the TX signal was completely unfiltered after the DAC. So proper lowpass filters for every band will be necessary anyway. 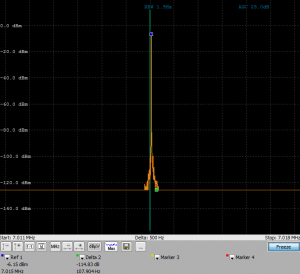 Probably also the input of the MMIC was a bit overdriven. I did not check this so far. Looking to the spectrum that would fall inside the amateur band during real world operation another effect appeared. 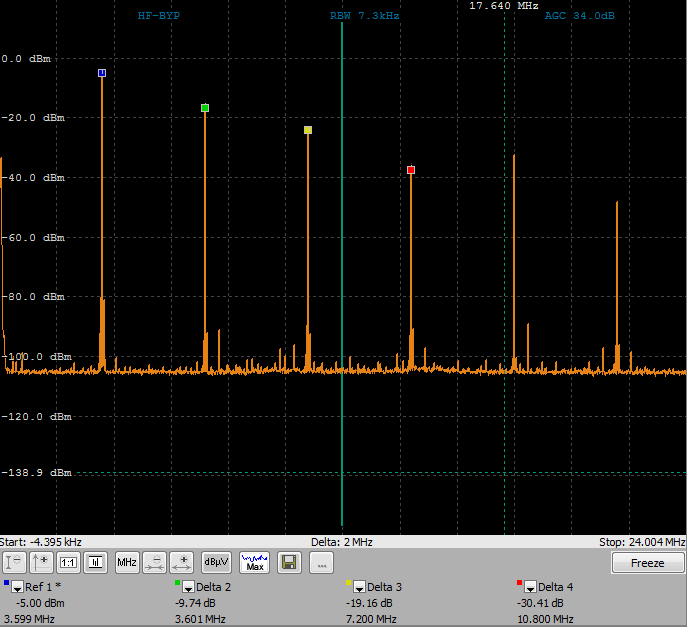 Independant which frequency is used there are symmetric spurs left and right of the TX spectrum. 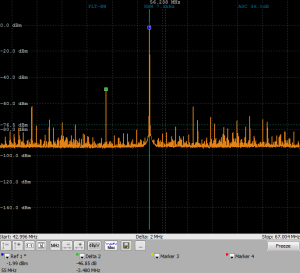 Two at +-52kHz and two (with more noise) at +-61kHz. Currently it is not clear if these come from internal circuits of from the power supply. Probably both ? Overall the performance is already rather good. Especially at the top end of the frequency range there is range for improvement which is necessary to make the frontend a good choice for usage with transverters for VHF/UHF contest operation.